"Sometimes life really does get in the way." The new issue has just been released to subscribers in PDF format. This issue, and subsequent ones, will not have a print edition. 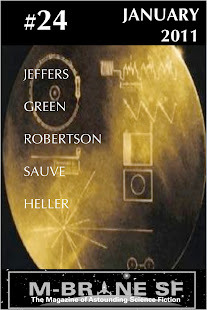 The contents of this issue and the next two, along with some bonus material, will form M-Brane SF Quarterly #1 in October, the first of the new quarterly print version. 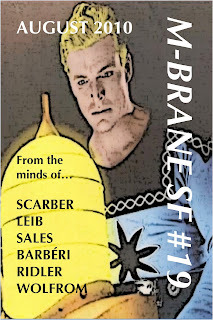 Links to subscribe to the monthly PDF or find back issues in PDF and print may be found at the M-Brane Press page. That site's "under construction" period continues, but it's functional. Also, on the M-Brane Press page, I had been offering issue #17 from June as a free sample of the magazine, but I have replaced it with the new issue #19. Because of an appearance in #17 by the first-rights-reselling author mentioned a few days ago here and in many other places, I don't feel good about free distribution of it any longer despite how good its content was. I may produce a redaction of it, excising the non-original piece, and then repost the link to that issue.